Posted: August 20th, 2013 under DX, Hamradio, Iota, Soundclips. 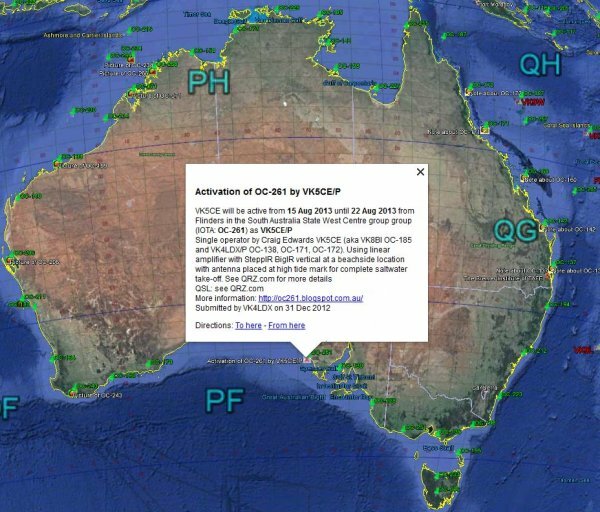 I've seen VK5CE/P from OC-261 spotted at times, but most of the time only on SSB. So I haven't bothered too much with checking out the signal and I haven't been on at the right time. However, today I noticed him being spotted on 20M SSB at the time I was in the front of the radio. I tuned in and checked, but I could not hear a thing. I was listening for several minutes without even a tiny whisper. Right when I was about to check the band for other VK's to check conditions, he was back on the frequency with a good signal. After just a few calls he was logged easily for a new iota. Thank you very much for the contact and a new iota Craig! Listen to his signal below and read his blog here.